FraZzled MoM! 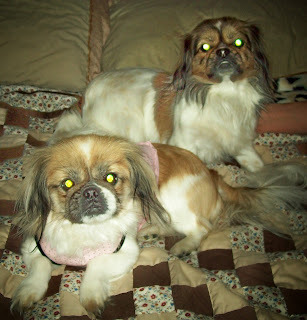 : New Years Puppy Posse! Above is lil Miss boss of the house (or so she thinks) Hazel Baby, shes wearing a pink and black velvet Bling Bling made by people at walmart....shes sportin' it well, I know! She is my my angel with devil hornes! 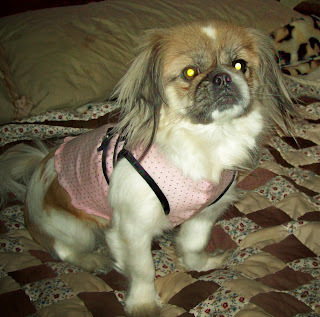 The above picture is of My Tibetian Spaniel Hazel (we call her Witch Hazel cause she can be a grumpy Gus!) sitting Pretty in pink and her sister Holly who is refusing to even play with her accessory bone....shes done with the photo shoot already. 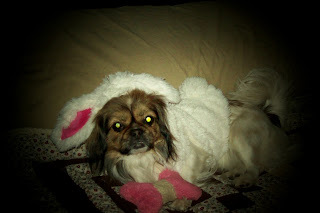 This is My Tibetan Spaniel Holly (also known as) Hollywood dressed in her winter warm Bunny Costume complete with Pink Bone accessories! 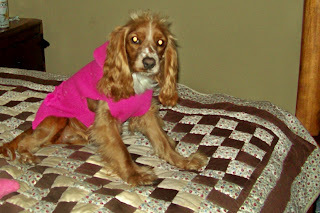 And this lil cutie patootie and Cocker Spaniel is Miss Ruby Sue the newest member of my life looking dazzling in her pink knit ambercrombie sweater...dog has more expensive clothes than I do! Go figure, I'm sick and wrong!